Innovation is like the oxygen that organisations need to stay alive. Without it, organisations die. Many organisations claim to be innovative but often, the reality is that innovation is fragmented and bolted-on to a non-strategic function. This invariably stifles creativity, affects motivation and hinders performance. The net result is a precarious business position and a non-sustainable innovation pipeline. Investor in Innovations is an integrated, leading-edge Standard that offers a practical way to validate, benchmark and drive innovation systematically. It uses a well-defined six category framework that connects your industry insights, market intelligence and technical capability with your processes and business model. 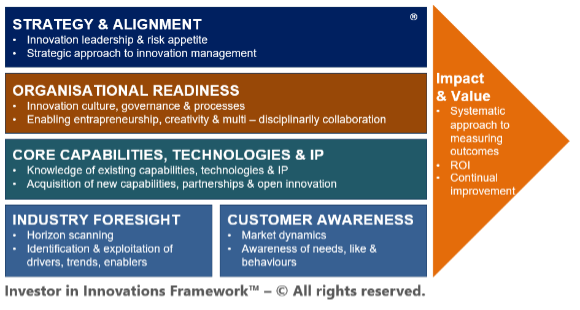 The resulting impact is a stronger innovation culture, opportunities for performance improvement, diversification (product and market) and a visible differentiation of your organisation as an innovation leader. Achieving the Investor in Innovations Award will enable the organisation to demonstrate to its stakeholders a strategic commitment to innovation that has been validated independently. The Investor in Innovations standard was published in the prestigious Science in Parliament Journal. Click here to read the article. Educational providers (Colleges and Universities). Thus, differentiating your organisation as an innovation leader.